Cerevo, an Internet connected consumer electronics manufacturer, is pleased to announce the global launch of REC-1, the newest member of its XON series of smart-sports devices. REC-1 is a full HD sports camera that is bundled with a small external sensor. The bundle will be available today for pre-order at the Official Cerevo Store for US$299/€299 (Incl.VAT), and the product is currently scheduled to ship in May. 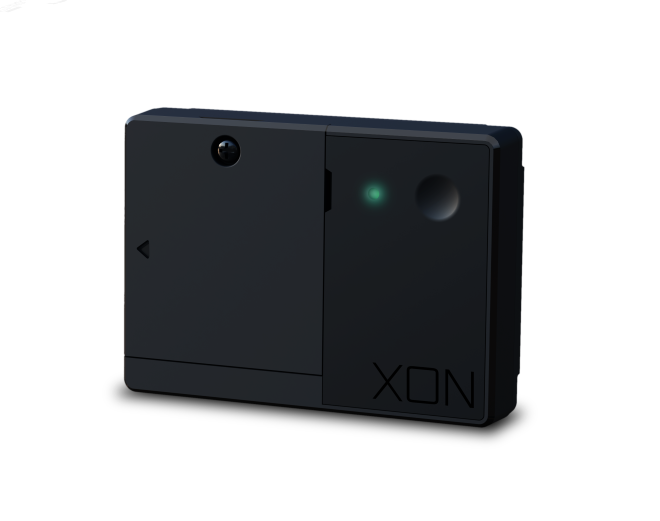 Also the external sensor will be available separately as a single unit without REC-1 under the name LOG-1 for US$89/€99 (Incl.VAT) and is scheduled to ship in April. Both packages will be available on Amazon.com later this Spring. Sports cameras that are compact and lightweight and can be attached to competitors and vehicles have become widespread in the last few years and have to be used in various sports and activities such as automobile racing, survival games, soccer and tennis. In addition, technologies for visualizing sports using data analysis are also being used in professional sports, data is acquired from sensors attached to athletes and sporting goods, not only for spectators and TV viewers, but also for athletes themselves to analyze and improve their performance. We developed REC-1 with the aim of further visualizing sports through an interface that intuitively uses methods from the professional sports world, all at an affordable price range. Also, in response to the need for comprehensive data collection, REC-1 is bundled with a mountable sensor outside the camera. When sensors are built into the camera body, the data that can be acquired is greatly affected by the installation location of the camera, so there is a possibility that the data acquired is not you originally required. 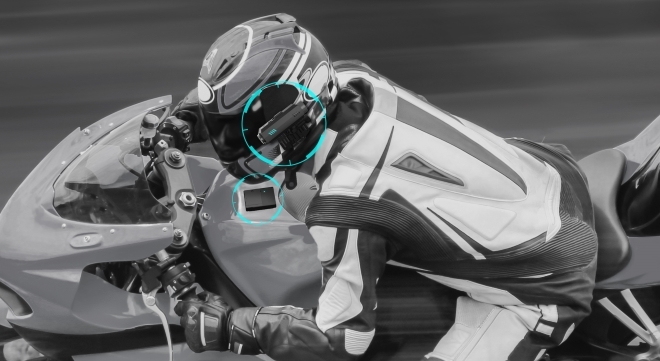 By installing the camera in a position that captures human viewpoint such as on a helmet or goggles, then separately installing the sensor in a location such as a motorcycle wheel or car suspension, REC-1 can meet the needs of sports experts with precise data overlaid onto video. REC-1 is a full HD sports camera equipped with Wi-Fi. In addition to shooting video at a maximum of 1080/60p and still images at up to 2304×1728 pixels, REC-1 can also stream video to a smartphone and start or stop recording remotely. So even if you attach it to a place which is difficult to reach, if you have a smartphone you can operate it remotely. Data such as speed, inclination and temperature are recorded by the external sensor. By connecting the camera and sensor to a PC, using our free dedicated software, you can superimpose the data acquired onto the captured video and easily create sports videos with the captured data. 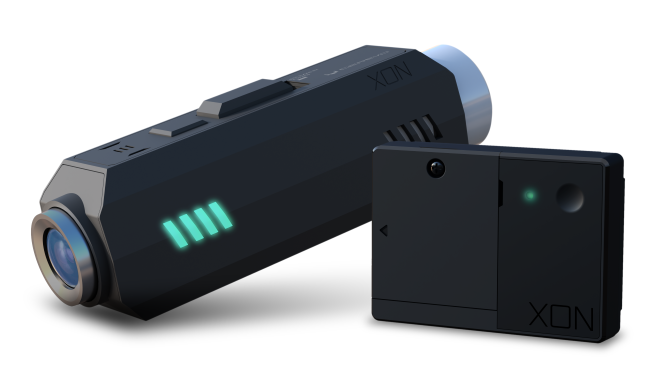 In addition, we plan to integrate other XON series products such as RIDE-1 and ORBITREC with the movie data. Alongside IPX4 equivalent water-resistance, REC-1 is equipped with a physical slide type switch to easily start recording while wearing gloves and a tubular body suitable for mounting on bikes and bicycles. 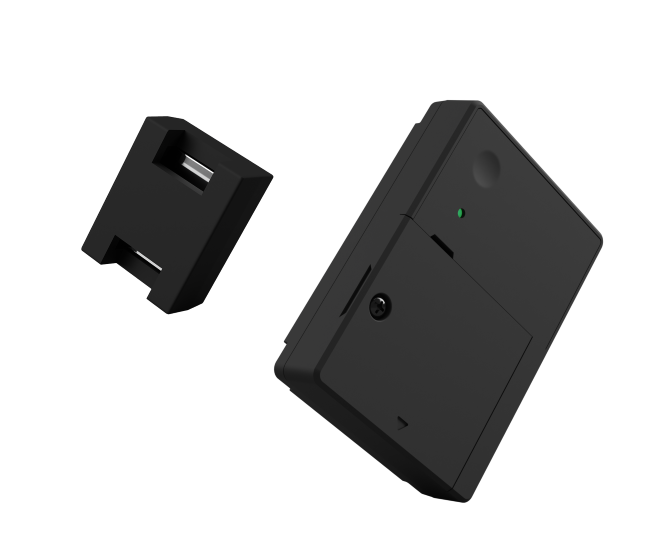 The battery can be removed and exchanged while REC-1 is mounted and with built-in GPS, you can record routes and speed data even without using the external sensor. 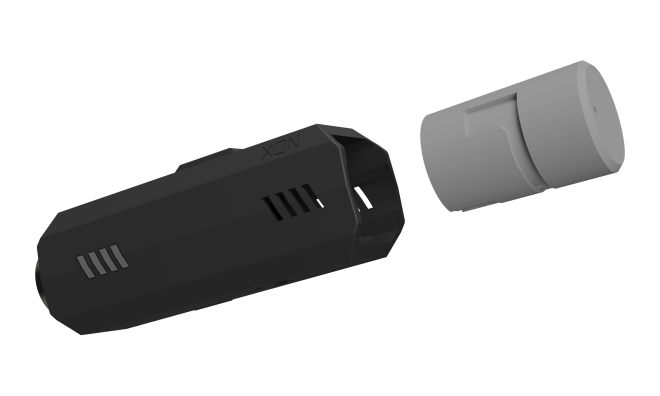 LOG-1 is a compact sensor device with 6-axes (acceleration / angular velocity), temperature, pressure and magnetism sensors and has an IPX4 equivalent waterproof rating for use in a variety weather conditions just like REC-1. LOG-1 has a tripod hole on the bottom of the main unit and can be attached to various sports devices using the bundled mounting tool or to a camera using commercially available camera mounts. LOG-1 can also be fixed to individual competitors using the included belt attachment. By attaching the enclosed magnet to a rotating object such as a wheel and using the magnetic sensor of LOG-1, you can acquire the rotational speed of a bicycle crank, car tire and more. The magnetic sensor can switch between cycle acquisition mode and state acquisition mode. So it is also possible to acquire on/off information on physical switches that is difficult to acquire with an acceleration sensor alone. The main body of LOG-1 measures an extremely compact 40×55×12 mm and weighs only 28 grams, meaning it can easily be attached to various sports equipment. Using CR2032 batteries results in a long battery life of more than 19 hours of continuous use and easy replaceability. 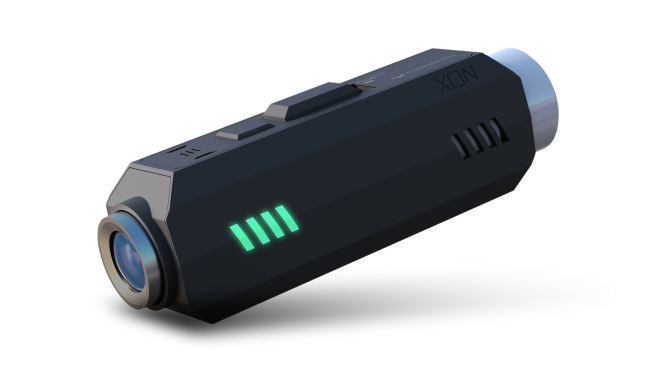 Because LOG-1 can keep recording data for multiple days on a single battery, you do not need to remove or install new batteries or turn on/off power, even for sports competitions that take place over several days. By connecting camera and sensor to a PC, using our free dedicated software, you can superimpose the data acquired on the captured video and easily create sports video with the captured data. In addition to REC-1, data from LOG-1 can be combined with movies shot with other companies camera’s (operation confirmed with GoPro series, Sony Action Cam and iPhone). Also, it is possible to overlay data acquired by multiple LOG-1s onto one movie. Cerevo Inc. (Consumer Electronic REVOlution) was founded in 2008 and is located in Tokyo, Japan with a branch office in Redmond, WA, USA. Cerevo is a small batch company focusing on making unique networked devices and connected solutions for both consumer and professional users based on its “Global Niche” concept. Cerevo’s products have been recognized globally and are sold in more than 55 countries. A selection of high resolution images for REC-1 and LOG-1 can be found at the link below.